Receive VIP treatment and get chauffeured from your hotel door to San Francisco North Bay's historic Muir Woods, Mt. Tamalpais, Point Bonita Lighthouse, Tiburon Island, Sausalito and many more iconic destinations. When you have your own executive car and driver in San Francisco, there's absolutely no better way to jam-pack your day full of fun with family and friends while visiting the Bay Area. As soon as you book your Marin County Scenic and Wine Tour with us, our concierge will spend time over the phone as well as over email to customize the best scenic destinations and itinerary combinations for your group, purely based on the group's collective preferences in order to maximize the potential of your day with us in the Scenic North Bay. Our sight seeing chauffeur will arrive at your hotel or pick up location of your choice in a black on black luxury SUV or sedan to pick up guests up to 7 people. We provide the option of guests enjoying a bottle of wine on us, at the beginning of the tour. Otherwise the bottle of wine we provide for the tour will be saved as a gift at the end of the tour. Immediately from your desired pick up location we will begin our journey North, toward the Golden Gate Bridge. Before crossing the Golden Gate Bridge, your chauffeur will be able stop off at destinations like The Palace of Fine Arts, if desired. Upon Golden Gate Bridge crossing, guests can either get quick photos taken at the North point parking lot, or right on the water, just a few minutes of a drive further. From point (just North of the Golden Gate Bridge), guests will have the option of stopping in downtown Sausalito, visit the Nike Missile Silo or head straight to Muir Woods. 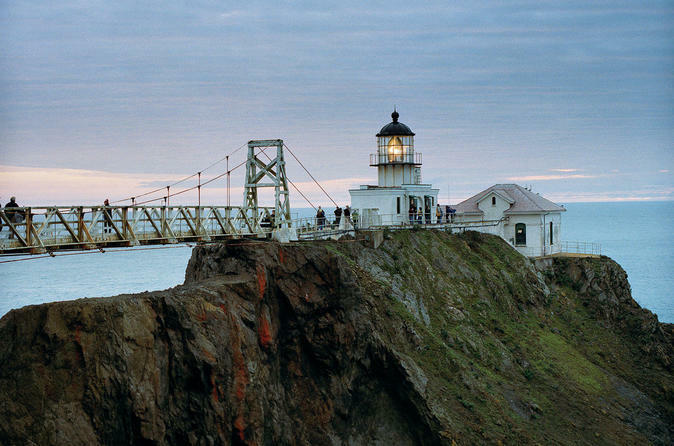 Point Bonita Lighthouse is another scenic destination to consider as well! After your group spends the time desired at each location, your chauffeur will be waiting curbside to take you to your next destination of your choice. At any point during the trip, guests may ask to stop for lunch or dinner, so long as it is done within the 6 hour time frame (including the pick up and drop off time duration). Guests will be safely transported either back to the original pick up location, or another location specified by the guest group.